What I would give for a wig! « Hercules and the umpire. There more tasteful alternatives, however. There’s many more options but I should probably stop and go study. Best of luck, your honor! Wear a wig? I think you should take the bench without a robe and sit on the same level as the jurors, who, by the way should face the jury box and not the opposing wall where a clerk or someone usually sits. I love the “Adult Lincoln Hat.” While it is not perfect for the bench, it is perfect for wearing while riding in my old Cadillac with the fake gold stuff. Super neato! My jury box is to the right of the bench (from the judge’s perspective) and faces directly at the witness box–a literal box directly across the well of the court from the jury. You want me to step down and sit with all the others? Oh, my no. That would not be federal. Reading that post was like reaching down for a pebble and picking up a semi-precious stone. Thank you. Don’t forget the gold grill over your teeth. You are too kind. All the best. No, Sir. You need this wig. You also wondered awhile ago about gussying up your judicial wardrobe. That gentleman has a nice jacket for you, too. And both will match your gray hair nicely when it returns. I agree with E Hines, although I was kind of partial to the caveman in the same group. And, the bone would make a much more impressive gavel. I would suggest that he focus is all wrong. Rather than worrying about drawing attention to the top of your head, I suggest wearing a robe similar to the late Chief Justice Rehnquist: http://www.slate.com/articles/news_and_politics/kausfiles_special/2000/06/rehnquists_scandalous_shmatte.html. Now those are some glad rags! And, did I mention how stupid I think it is that the jurors cannot discuss the case amongst themselves during the trial. How does that conflict with keep an open mind? Just stupid. So, you are going to say something like they always get it right, eh. Not always. Only in the simple ones. How’s this, Judge: sit in the jury box and see what the jury sees. You don’t see squat from the bench, though I admit I haven’t been in your courtroom. And, I have to tell you to have a good shabbos. Will pray for you tomorrow morning, giving to you the prayer I get for my Kohane aliah. Glad rags indeed. They were from a Gilbert and Sullivan comic opera to boot. 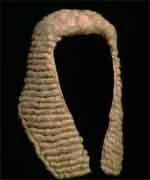 The robe the Chief copied came from The Lord Chancellor (comic baritone) in that opera. I always thought of the stripes as a bit of self-mocking fun. All the best. I really, really want to do that with the bottom row of my false teeth. How cool would that be? You are a sweet man Lorin. Thank you.